Prices of bread and all other wheat products on the Copperbelt will increase starting tomorrow, September 1, 2015. The cheapest loaf of bread will be K7 PF money or K7000 Zambian Kwacha. 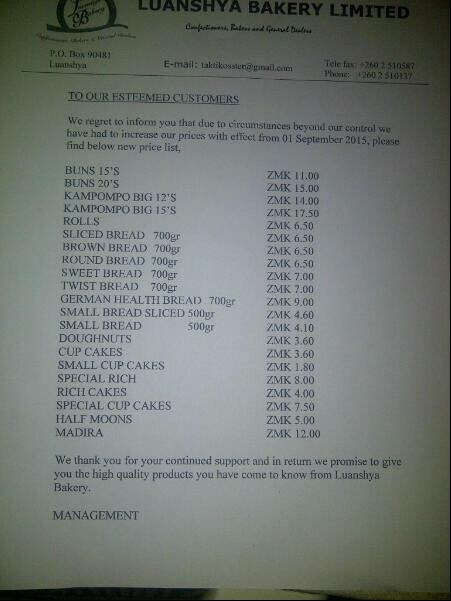 Bakeries have already announced the increase for wholesale prices of bread to K6.50 (K6,500). Luanshya bakery, one of the biggest suppliers of bread and bread rolls on the Coppebelt says it has increased wholesale prices due to forces beyond its control. These forces beyond the bakery’s control are high production costs brought by expensive fuel, lack of power and other problems obtaining under the PF regime. President Edgar Lungu was yesterday at pains to explain that the deteriorating economic conditions in the country is not due to his poor leadership.